Beautiful 14k yellow gold dainty dangle earrings are for the special child in your life. The earrings will be easy for the child to keep on with the lever backs. It is fitting these special earrings are crafted of gold. The spiritual meaning of gold is significant, it is said spiritual energy and power are activated and awakened by wearing or praying with gold. Gold represents the spiritual treasure gained by transforming the spirit; gold also represents love in the Bible. These will be treasured for a lifetime and passed to the child's children. 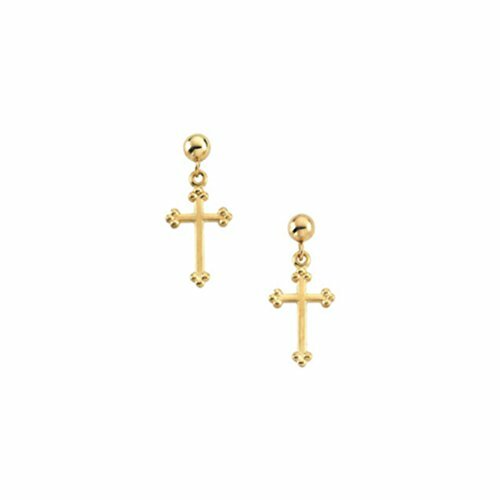 These Cross earrings are for the child as a symbol to assist in remembering the words of Jesus Christ to help make each day a living testament of actions in the small and big moments of life; for the reminder of faith during times of change, and to remember she is loved, always, all ways. And, forgiven...all we need do is ask. The rising price of gold makes these, quite simply, a great investment all around. Thank you for shopping at The Men's Jewelry Store (for KIDS), we appreciate your business.